While many agents and agencies shy away from auction campaigns, Macquarie Commercial pride themselves on their auction formula, auction success rate. and selecting which properties are suitable to take to auction. Matthew and Luke have an unmatched auction track record with a success rate in excess of 80% from 2012. When determining if a property should be taken to market via public auction, many factors are taken into account. These include current market conditions, whether the property will be sold vacant possession or with a tenant, the adaptability of the property, they key features of the property and mainly whether the property will receive a positive response from the market. 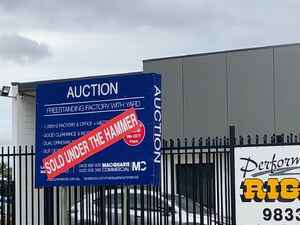 If a property is suitable for auction, Macquarie Commercial tailors a marketing campaign specifically for the property. The marketing campaign is both cost-effective yet targets active purchasers, ensuring the vendor will see the best results on auction day. A marketing campaign generally runs between 6 - 4 weeks and may include press advertising, Internet advertisements, brochure distribution, canvass calling, information memorandums, signage etc., dependent on the vendor’s preferences and budget. and the specific agent’s recommendations.